For the month of July, we’re bringing back the Maple Pecan Cold Brew! If you’re not familiar with this special from last year, it’s a bit of our house made 14-hour cold brew, Malk pecan milk, and maple syrup. Sweet and refreshing for the hottest days of summer. We’re also continuing the Oatmeal Latte that we re-launched a few weeks ago. This drink is simply espresso, brown sugar, and oat milk. We first featured this drink in 2016, but we found it difficult to consistently get the oat milk that we were using. This is no longer a problem thanks to our friends at KLLR Coffee and their distribution, so this drink won't be disappearing at the end of its run on the specials board. It will just find a home on the secret menu. Our specials board looks like it has a theme this month. Everything on it is vegan. When we started Clarity in 2015, we had two alternative milks on the menu: almond and soy. Then we discovered how delicious coconut milk could be and added it as a special and then, eventually, as a permanent addition to the menu. Since day one at Clarity, we’ve had sustainability on our minds. Serving coffee has an impact on the environment no matter what precautions we take, but we know we can mitigate that impact through intentional decisions and expanding our non-dairy options to fit all sorts of tastes. Last month, we added oat milk as a permanent offering. 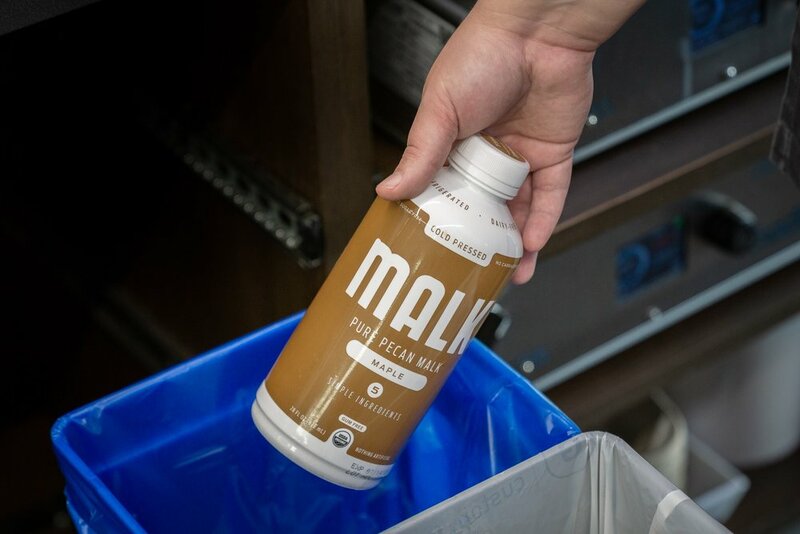 Now, with pecan milk added on for the Maple Pecan Cold Brew, we think it’s a great moment to talk about what alternative milks can mean for coffee, namely sustainability. When we look at a drink like a latte, the milk actually accounts for two-thirds of the carbon footprint. Using a plant-based milk alternative significantly decreases that footprint. Almond milk, for instance produces less than half the emissions that dairy does, even after accounting for the longer distance it has to travel. Coffee is hugely affected by climate change. In fact, a study in 2015 estimated that land suitable for growing coffee will be cut in half by warming temperatures by 2050. The warmer weather has already caused an increase in pests and diseases that have actually caused national emergencies in coffee growing countries. The impact on the rest of the coffee supply chain reminds us of our responsibility to the environment. Here are a few of the things we’re doing as a company to be better. The most important thing you can do to limit your environmental impact is reducing what you use. We take that seriously and always have. For instance, we worked with TAP Architecture to use the latest in lighting technology. Every light in our entire space, save one, is LED. Most of our coffee equipment has the ability to go into an energy saving mode at night, so we can both reduce energy usage and limit the wear and tear caused by heating and cooling the machine daily, a nice compromise. And this effort continues even now. Last month, we installed new insulation in our ceiling and on our heating and cooling system to make that part of the space even more efficient. An even bigger impact, wasted coffee and milk plague both a coffee shop's carbon emissions and their bottom line. When we get together for training, we keep more than just quality and extraction on our minds. Part of the job of a great coffee professional is to limit the amount of coffee, milk, and other materials that are wasted. We won’t serve you a drink that isn’t exactly right and reliably tasty, so the occasional drink has to be tossed. What we can do is limit the amount of mistakes that happen through a constant training effort and utilizing the latest technology to avoid inconsistency. We work to be consistent in dosing out and steaming milk, so we rarely steam more milk that we need, which would be poured down the drain. Then we use a milk pitcher rinser to quickly rinse milk out. And that’s not just to save time. It saves thousands of gallons of water per year versus rinsing in a traditional sink. And when it’s time to clean them more thoroughly, we use products from Seventh Generation and Better Life to make sure nothing harmful ends up in our sewer system. Sometimes you need to take your coffee to go. No judgments here. We have disposable cups available every day. And if you’re able to bring your own cup, we’d love to put your coffee in it. Don’t have one? We have Hydro Flasks available in black or white. But when you can, we love for you to stay and enjoy your coffee here. Not just for sustainability’s sake. We also just love having our friends here drinking coffee with us. Next time you stay, we have reusable cups in all shapes and sizes to fit perfectly with the drink you’re enjoying. Drinks that are traditionally stirred, like cappuccinos, espressos, and the like, are served with a small spoon to eliminate the need for disposable stir sticks. And just recently, we added reusable totes to our shelves for those who are interested in cutting down on disposable grocery bags. Keep an eye out for these new totes and the Hydro Flasks on our online store. There are two recycling bins here in the store, and we take it seriously. We go through dozens of gallons of milk, tons of La Croix, and plenty more each week, and every last carton, can, and bottle is put into the recycling bin. At first, we were packing our recycling up at the end of each day and taking it to a large bin, but after a few months of that, we partnered up with Fertile Grounds to do a weekly recycling pick-up. They’re an outstanding organization and if you have any recycling or composting needs, I highly recommend them! Improving our sustainability is a constant process. There’s always something more we could do. The next step for us is to eliminate our plastic straws by working with the paper straw company Aardvark. Our aim is to have this going by the beginning of August. Stay tuned to the blog to learn more about Aardvark, paper straws, and why it matters. We're so excited to start inventing fall drinks. September gives us our first opportunity, so check out what we came up with. Unfortunately, we are saying goodbye to the Cherry Vanilla Latte, but I'm excited to tell you that you'll still be able to get the Cold Brew Lemonade and the matcha lemonade year-round. In fact, you'll find the matcha latte and lemonade on our new permanent menu! For September, we wanted something with a feel of fall (only three weeks away!) but still a hint of summer. As always, we keep the ingredients simple: maple syrup, rosemary, milk, and most importantly espresso. We paired pure maple syrup with rosemary to create a syrup that takes sweetness from maple syrup to a whole new level in an herby/savory latte. Come try it out hot or iced or, get this, as an iced americano. Seriously tasty. And don't miss our featured tea: pineapple coconut black tea from Urban Tea House. It is exactly what it sounds like and will make you feel like you're on a beach. So swing by and try it out this month. We'll be here.